As I think about the popularity of Kindness Rocks locally, I remembered doing a 24 Days of Random Act of Christmas Kindness. It was about inspiring others to show kindness towards one another and paying it forward. I am actually going to start with a story that happened at the end of my “RACK” journey. It brought tears to my eyes as I read and remembered it. Look out for each other and be kind. After the story, you will find a number of suggestions each of us can do, not only during the Christmas season but always. Appearing a little taken aback and almost a little embarrassed, she said “Yes”. Me: I took one of the bags and held her arm as she walked over to her car. I replied, “Yes, it did snow quite a bit.” I opened her back seat and put the shopping bag I carried for her along with hers into the back seat. She said, “Yes, it was a lot of fun”. I then helped her into the front seat and shut her door. I immediately hopped back into our car and we drove off. Choking back tears, I recounted our conversation to my daughter. I have to admit, this was the best “Random Act of Christmas Kindness,” even though it wasn’t part of my 24-day challenge and it was after Christmas. It didn’t cost any money, there no pictures, she wasn’t expecting it, she was kind and grateful, it was heartwarming and we both have the memory. My “Random Act of Christmas Kindness” has made me just a little better – and not with what I have done, but the impact others and God’s grace have done to me. Sometimes one goes through life without stopping or pondering about life that goes on around them. I wish for more times of pondering and breathing and thinking and feelings of gratefulness. And I also wish that for you and our world. . .
“Random Act of Christmas Kindness” is all about people who provide us service that we sometimes take for granted. 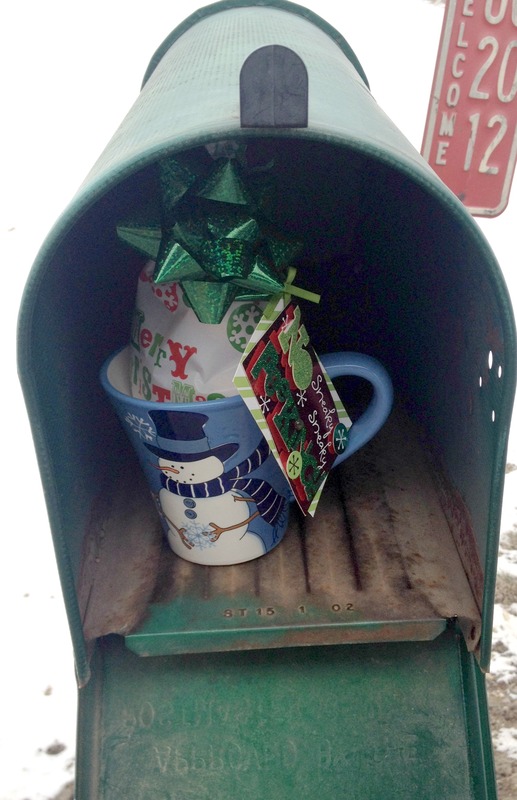 Put together a coffee mug with Christmas goodies and put it in your mailbox before the mail arrives on Christmas Eve. 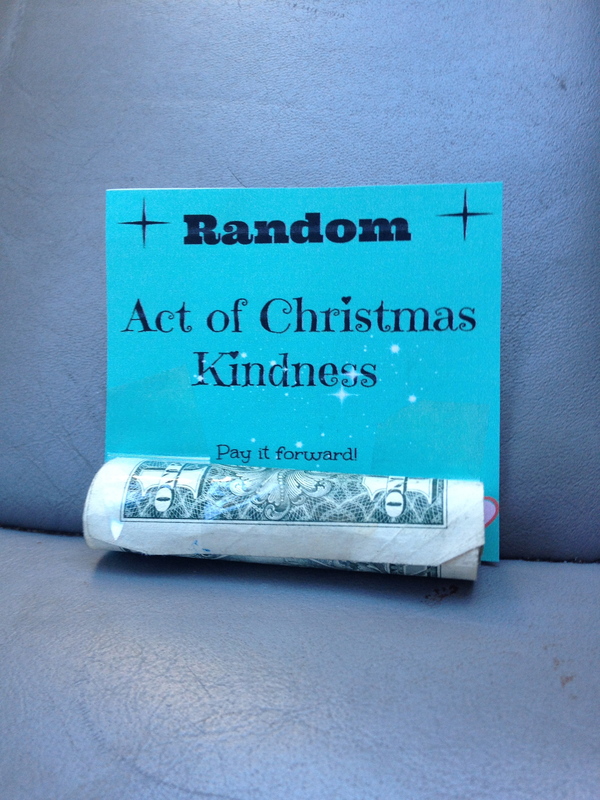 “Random Act of Christmas Kindness” involved picking up the tab of another restaurant patron. Randomly choose another couple’s meal tab to pay. Prepare a meal for someone. Do you know a young mom, who is very busy and stressed out? The perfect recipient for a home-cooked meal. Give a grocery gift certificate. I decided to tape a grocery gift card to a grocery shopping cart. I taped it to the part where you would sit a young child near the front of the cart. After the card was taped, I returned the cart to the cart corral area. Another idea is to purchase a grocery store gift card and give it to the person behind you in line. Both great ideas! There are just some images that shout “Christmas”. One of those images is bright red poinsettias. What a better place to deliver poinsettias than to nursing homes? As hard as a person tries, nursing homes just have that institutional feel about them. Giving the residents something to look at that is beautiful and “Christmasy” is my act of kindness for today. Deliver beautiful poinsettia plants. Ask them to put into someone’s room who may not normally receive a Christmas gift. Put a “goody bag” together and secretly give them to some of our senior citizens. You can have a lot of fun with this. Involve your children or grandchildren. Too many people are food insecure or just don’t have enough food for their families. And no one should go hungry, especially during the holiday season. I feel we can all give a little to help those that need it. An unsuspecting motorist can use to help their pay gas bill. Filling a gas tank can cost a lot of money these days, so I am sure any kind of help is appreciated! Donate a bag of dog food to the local Humane Society. I have stated many times for people to donate to their local humane society and not the Humane Society of the United States. HSUS is NOT your local humane society, but rather pushes a vegan, anti-livestock agenda. Your local humane societies are about the dogs and cats that need a good home. Give a free car wash! Pay for the order of the car behind me in the drive-thru. This unsuspecting person was about to receive a free meal. When I told the cashier that I wanted to pay for the car behind me, she was not surprised. My guess is they have other customers do the same thing. Give Salvation Army Bell Ringers a gift card and tell them thank you. Maybe a Starbucks or Caribou gift card? Christmas or not, laundry still needs to be done. Tape money to a washer and/or dryer in a laundromat. Salvation Army has a “Christmas Angel” program where you can select a child or children to buy presents. Just a nice gesture, nothing more and nothing less. Leaving behind enough money to buy a bottle of soda! Hope someone enjoys and passes along a “random act of kindness” to someone else! Insert five $1 bills, each taped to a Random Act of Christmas Kindness card, in five random books at the library. Four out of the five books have a Christmas theme. The hardest part was putting the dollar bills in the books discreetly. I had to be sneaky and probably looked guilty because I was looking around to make sure no one was watching. Anonymity is imperative! Will they pay it forward by showing someone kindness? Go Christmas caroling!. Visit a local church member’s home or nursing homes. It was very neat to see the residents join in with the singing. Appreciation and joy were shown all over their faces. These are just. a few things everyone can do to put a smile on other people’s faces. And if you are the recipient, please pay it forward. Day 24 of the “Random Act of Christmas Kindness” is all about people who provide us service that we sometimes take for granted. 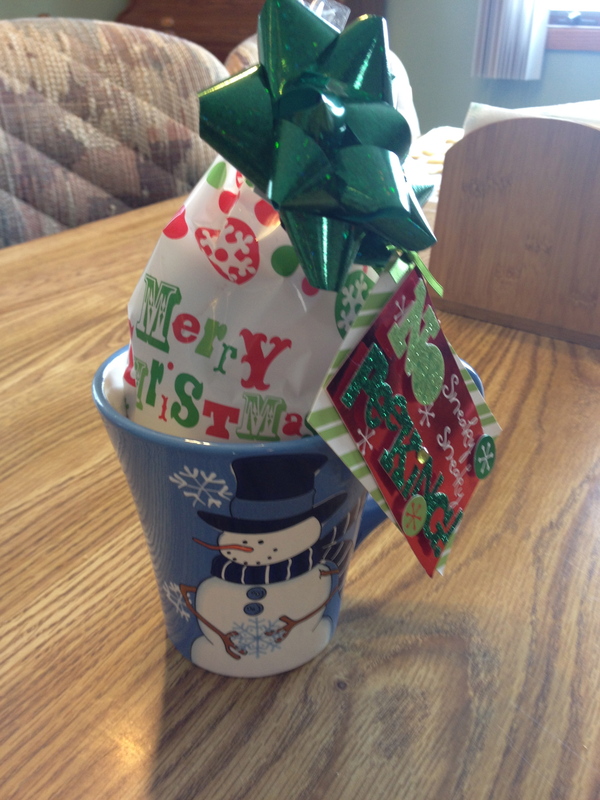 Today I put together a coffee mug with Christmas goodies and put it in my mailbox before the mail arrived on Christmas Eve. I will say I have never done this before so I am pretty sure our mailman was surprised! 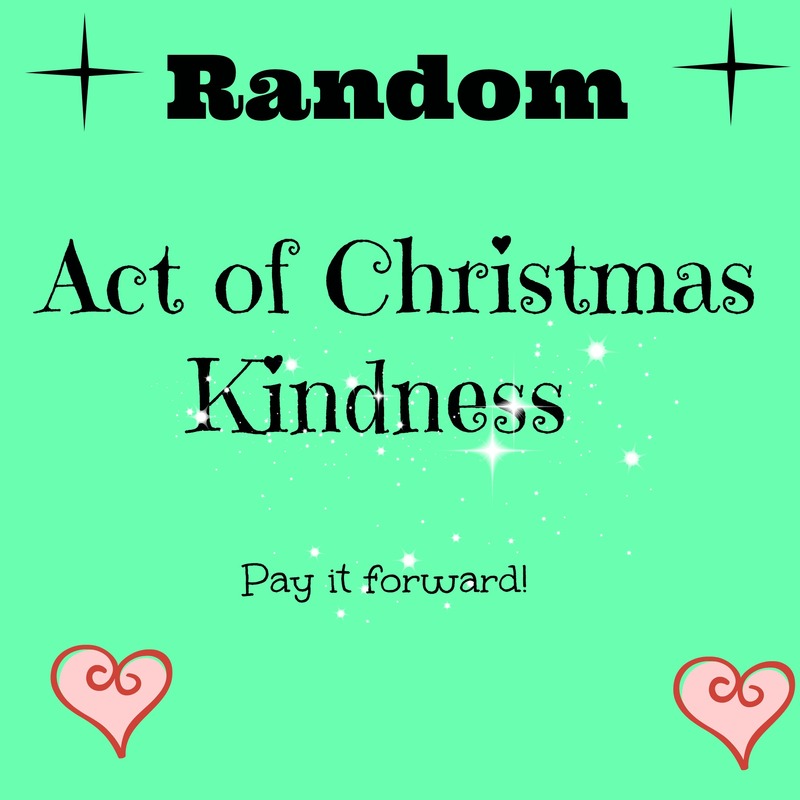 Just curious, what have you done lately for a random act of Christmas kindness? Day 23 brings dollars for my “Random Act of Christmas Kindness!” I wrapped dollar bills and taped them to Random Act of Christmas Kindness cards and then hid them in our local Dollar Store. It was a bit challenging finding places to hide them as the store was very busy with people shopping for their last-minute Christmas shopping. Hoping this put a smile on a few people’s faces! My “Random Act of Christmas Kindness” on Day 22 involved picking up the tab of another restaurant patron. 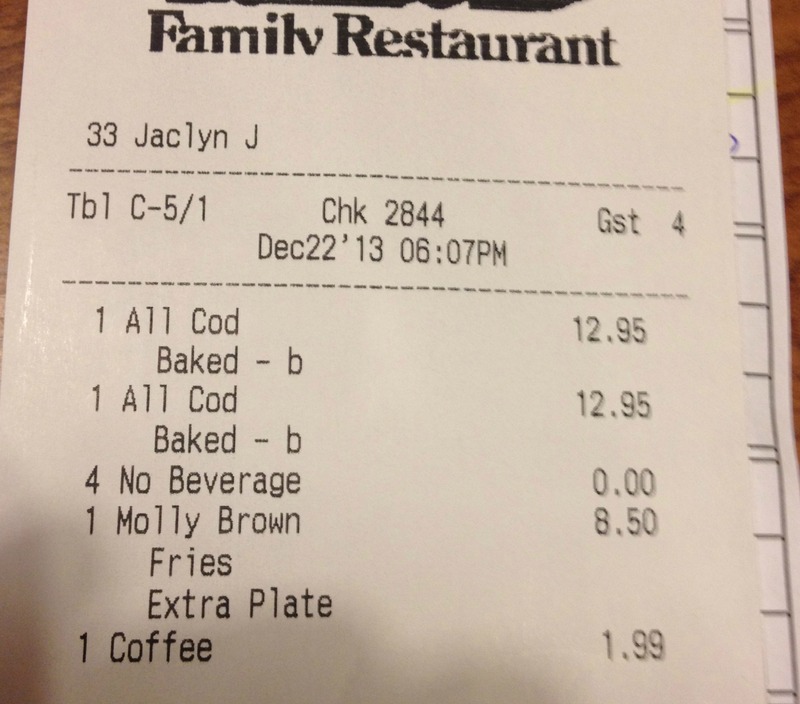 Tonight my daughter and I were dining when we randomly chose another couple’s meal tab to pay. When it came to paying their bill, I was not expecting a meal that was split between the two of them. So it was much less than I expected! We did hear they were very surprised when they received my “RACK” card instead of the bill. I love putting smiles on people’s faces!